Looking for Moroccan recipes that are simple or easy to prepare? Some of the recipes listed here can be made quickly as well. This easy tagine recipe is a popular family meal in Morocco. Use beef, lamb or goat meat. Carrots or other veggies can be added to the recipe. This easy Moroccan recipe was taught to me by my mother-in-law, who served it as a family meal with Moroccan bread for scooping everything up. Olives and preserved lemons impart a unique, tangy flavor. If you like things spicy, add a little cayenne pepper to the Moroccan seasoning of ginger, turmeric, and cinnamon. One of the most classic Moroccan dishes is also among the easiest to prepare. There are several ways to make Chicken with Preserved Lemon and Olives; this is the stove top method. The recipe links to recipes for roasting the chicken or preparing it in a traditional tagine. I usually make this easy Moroccan recipe as my Moroccan neighbor taught me – in a heavy-bottomed pot with lots of sauce for scooping up with Moroccan bread. Directions are also included for preparation in a traditional tagine. Preserved lemon is optional. Mechoui is traditionally prepared by roasting a whole lamb either on a spit over a fire or in a pit in the ground. The meat is eaten by hand with salt and cumin for dipping. This mechoui recipe calls for very slowly roasting a leg of lamb or shoulder in the oven until the meat is tender enough to pull off the bone. This is Moroccan kefta, and eggs at their best - with caramelized onions, saucy tomatoes, and tangy olives. If short on time, skip the caramelizing and cook the onions and tomatoes just long enough to soften. Harcha (or harsha) is a Moroccan pan-fried bread made from semolina. Although it looks a bit like an English muffin, it's more like cornbread in texture and taste. Offer harcha for tea time or breakfast; they're best served warm with jam, cheese or syrup made from melted butter and honey. This spicy vegetarian carrot and chickpea tagine is quite versatile. Increase the cayenne pepper for a fiery quality, or add a bit more honey and the optional raisins for a sweeter dish. Using half broth instead of all water will add some depth. This tangy fava bean puree is flavored with garlic and lemon and can be served as a dip or a soup. You'll also want to try Serrouda, a Moroccan chickpea puree simply seasoned with saffron, salt, and pepper. Moroccan stewed lentils are flavorful and can be served as a side dish or entrée. This recipe is the vegetarian version. Turmeric gives this cauliflower the bright yellow color, while other Moroccan spices and preserved lemon add zesty flavor. Serve it as an easy side or ​​vegetarian main dish. This is an easy, delicious recipe for Moroccan Grilled Lamb Chops with Moroccan spices, garlic, and fresh herbs. This easy Moroccan recipe yields a semolina (smida) soup flavored with saffron and anise. It's equally satisfying as a supper and breakfast food and is traditionally served with dates on the side. Chicken cooked with lots of onions, saffron, and other Moroccan spices is easy to make and the savory foundation to a number of delicious Moroccan dishes. Try serving this chicken on a bed of rice. Baking is one of the quickest, easiest ways to prepare whole sardines. The simple additions of salt, pepper and olive oil are all that's needed to enhance the natural good flavor of this fish. 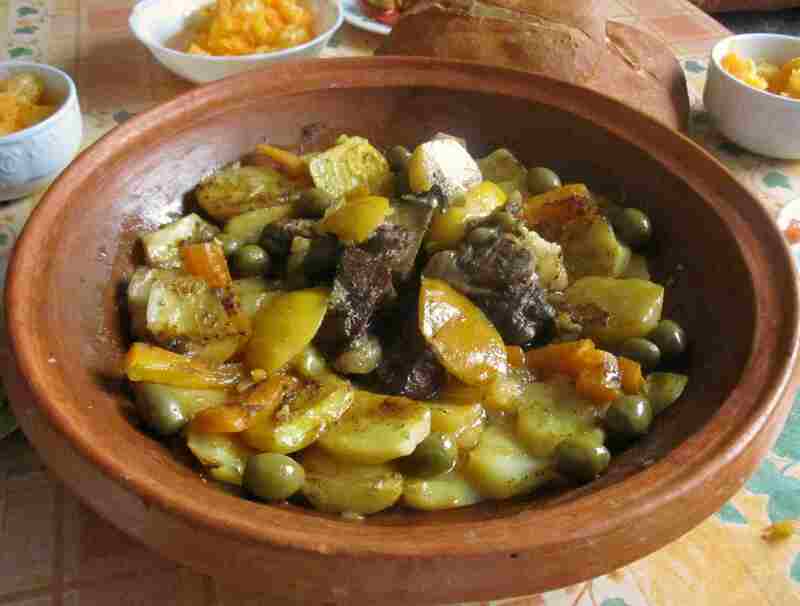 Meat with Olives and Preserved Lemons is a classic Moroccan dish flavored with onion, ginger, saffron, olives, and preserved lemons. It's very easy to prepare. Beef or lamb with prunes is a classic Moroccan dish that combines sweet prunes and meat with onions and the fragrant spices of ginger, saffron, cinnamon, and pepper. Using a pressure cooker shortens the cooking time. Kefta is ground beef or lamb, typically mixed with cumin, paprika, minced onion, coriander, and parsley. The mixture is very tasty and makes a superb kebab. These flavorful kebabs can be made with either chicken or turkey. Serve them as an entrée, appetizer or sandwich filler. Tomatoes are peeled, seeded and chopped, and then tossed in a vinaigrette with roasted peppers. This delicious Moroccan salad blends fresh oranges, grated carrots, and orange flower water. Serve it as a starter, side dish or as a refreshing follow-up to the main course. Amlou is a delicious Moroccan dip made from toasted almonds, argan oil, and honey. Easy to prepare, it's usually served for breakfast or tea time, or it can be offered as a sweet garnish for couscous. Beghrir is tender and melts in your mouth. They're usually served with a syrup made from butter and honey. Sliced oranges get simple yet sophisticated treatment with a generous sprinkling of ground cinnamon, sugar, and orange flower water. Serve this classic Moroccan dessert as a perfect ending to family meals and company dinners. This Moroccan Orange Cake Recipe is quick and easy to make, and delicious without frosting. One very large orange, or two medium oranges, should yield the half cup of fresh orange juice used in the recipe.